Forget everything in the last post about getting used to the desert... 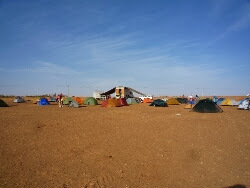 The moderate headwinds were storms and for some participants it was hard (or impossible) to reach camp before sunset. For others it was a good opportunity to team up, battle the wind and gain some hours. With solid teamwork in our group of three we managed to stay ahead of the others, even though it was a challenge to reach speeds of 20 km/h sometimes, resulting in rides of ore than 7 hours. The bike is holding up well in the sand and dust, so is my tent that I never before tried out in these circumstances. The legs are tired but ok, enjoying the rest day. Here in Dongola, situated along the Nile, it is hard to believe that the desert is waiting for us at the city limits. We're camping at an abandoned amusement park (although that may be too big a name for what it actually is/was) and are enjoying the luxuries of having water for a shower and laundy, and cold drinks. Another four days to the next rest day in Atbara. 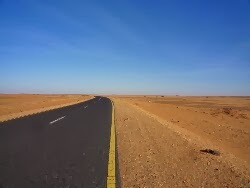 As we are heading south east from here, crosswinds are expected instead of headwinds, and with shorter distances and good roads this may be an easier four days, before we head into the desert where sand and navigation challenges are waiting for us.